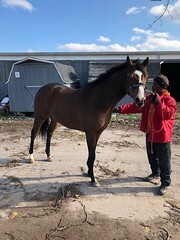 If handsome, very solid bodied and compact, good moving and with a sport horse pedigree to drool over is what you are looking for, Total Accounting’s numbers certainly do add up! 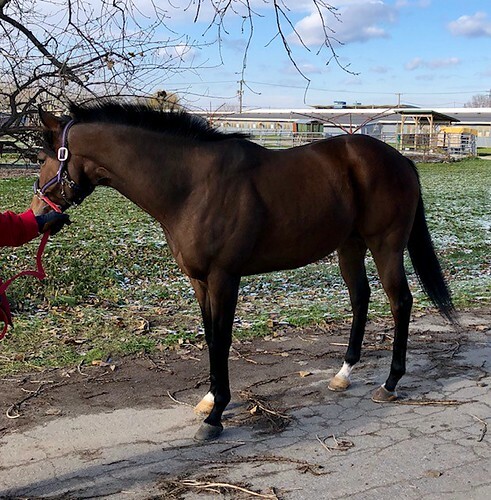 While we were waiting for his trainer to finish walking another horse, we hung out with Total Accounting outside his stall, enjoying his friendly curiosity. 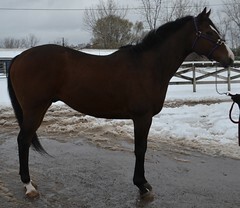 His trainer said he hadn’t done anything in a few days due to the winter storms that had gone through, but Total Accounting was very well behaved when he had to stand in the slushy snow and cold for his photos. 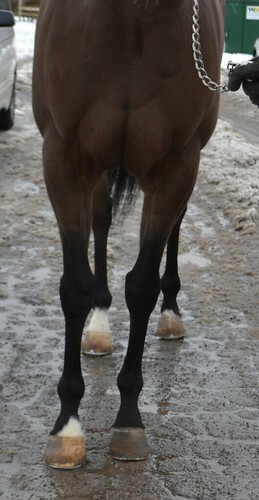 We admired his very sold body, strong shoulder and well developed top line. 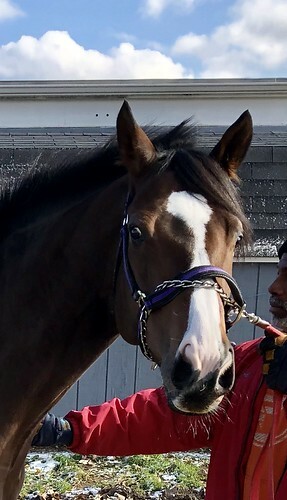 His trainer says he is sound and has no vices– “no problems at all” is how he put it. He just hasn’t shown much interest in racing recently, so it is time for a new career. For his jog video he showed very good ground covering movement with reach and loft as he had to high step through some deep slush…. suggesting that the water obstacles on an eventing cross country course or on trails should be no problem for him. He has won 7 races over his career, with an additional 13 seconds and thirds, so there is definitely heart and try in this guy. 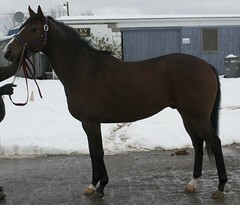 His sire is Sligo Bay, who has several offspring succeeding as steelplechasers or as eventers. Sligo Bay is a son of the great Sadler’s Wells, and is out of a Halo mare. These are sire lines that are greatly sought after in the psort/jumping disciplines. 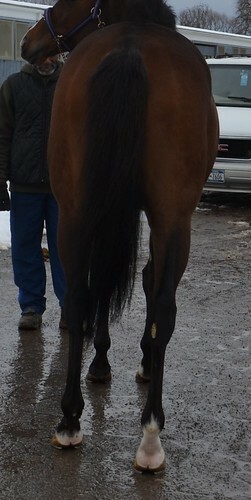 Total Accounting’s dam is by Unaccounted For, a son of Private Account — another top sporting sire line. This very attractive athletic horse is offered at an attractive end of the meet bargain price, so you should call fast on this one! The contact person is the owner, who is based in Florida and has a spanish accent, but speaks excellent English. 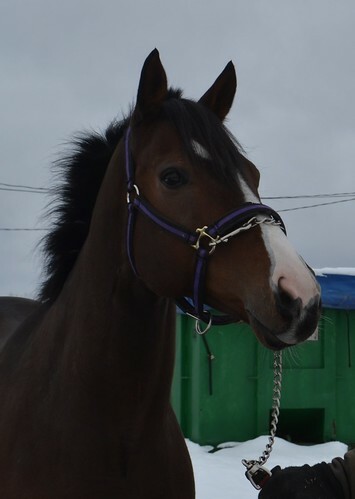 If you are going to the track and want to look at this horse, he is in Barn 19 middle aisle– ask for Manny.